The deadly Yarnell Hill Fire continued to rage out of control on Monday, a day after the flames fanned by erratic winds and temperatures topping 100°F overwhelmed a team of elite firefighters, killing 19 of the 20-member crew. The fire has burned about 200 homes and has burned through at least 8,400 acres — more than quadrupling in size since it began on June 28, according to news reports. 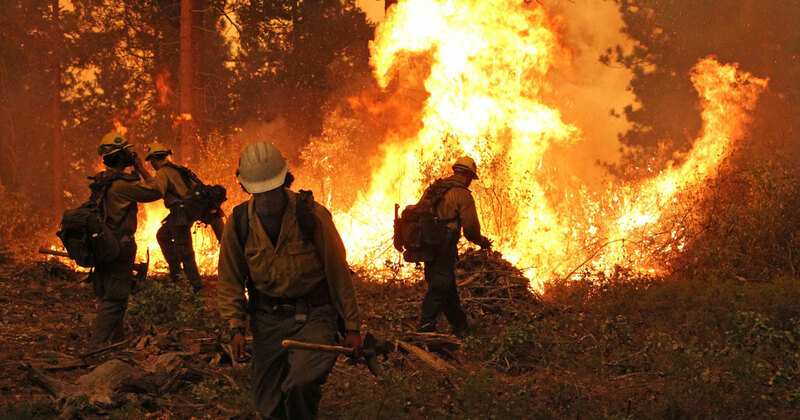 The deaths of the Prescott, Ariz.-based “Granite Mountain Hotshots” was the worst wildland firefighting disaster since a 1933 wildfire killed 25 firefighters in Los Angeles. It was the largest loss of firefighters in the U.S. since the September 11 terrorist attacks. Until Sunday, Arizona had suffered 22 wildland firefighting deaths since 1955, according to the National Interagency Fire Center. Yarnell Hill Fire from Congress, Ariz., from Matt Oss on Vimeo. 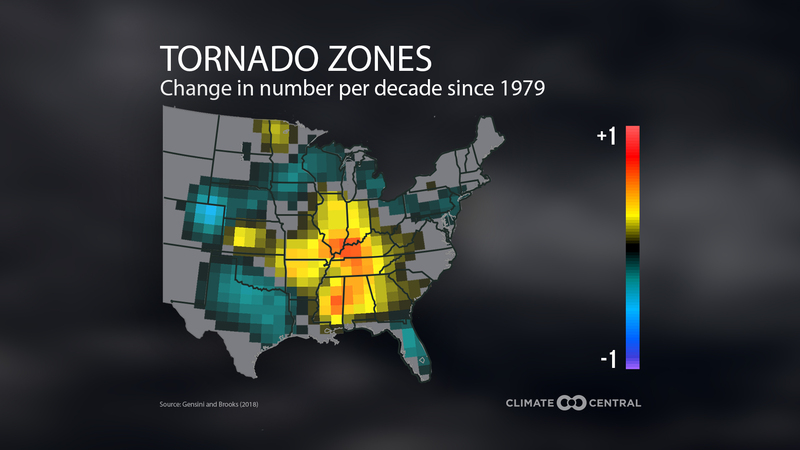 A lightning strike is the suspected cause of the blaze, and a brutal heat wave in the West, combined with bone-dry conditions, likely aided its spread. The high temperature at Prescott on Sunday was in the triple digits. The forecast for Monday called for high temperatures to hover near the century mark, with continued low humidity. Thunderstorms near the fire are a suspected cause of the erratic behavior of the flames on Sunday, when the firefighting crew was forced to deploy their last-resort fire shelters to try to deflect the flames. The Yarnell Hill fire, like other wildfires in the West right now, is taking place in the context of one of the most extreme heat waves on record in the region, as well as a long-running drought. 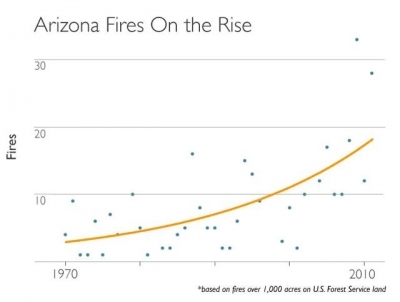 While the contributors to specific fires are varied and include natural weather and climate variability as well as human factors, such as arson, a draft federal climate report released in January found that manmade climate change, along with other factors, has already increased the overall risk of wildfires in the Southwest. And projections show that the West may be in for more large wildfires in the future. Climate models show an alarming increase in large wildfires in the West in coming years, as spring snowpack melts earlier, summer temperatures increase, and droughts occur more frequently or with greater severity. Statewide temperature trends in Arizona since 1920, with the post 1970 trend line drawn as well. Compared to an average year in the 1970s, during the past decade there were seven times more fires greater than 10,000 acres each year in 11 Western states, and nearly five times more fires larger than 25,000 acres each year, according to Climate Central research. Trends in large wildfires (greater than 1,000 acres) in Arizona, between 1970-2011. Due to a combination of drought and record heat, 2012 saw one of the most destructive wildfire seasons on record, with 9.3 million acres going up in flames, the third-highest since 1960. Over the shorter-term, firefighters battling the blaze may face more extreme heat through midweek, when temperatures may moderate slightly. Monthly and all-time temperature records have already been set across the West, including a high temperature of a scorching 129°F at Death Valley, Calif., on Sunday. 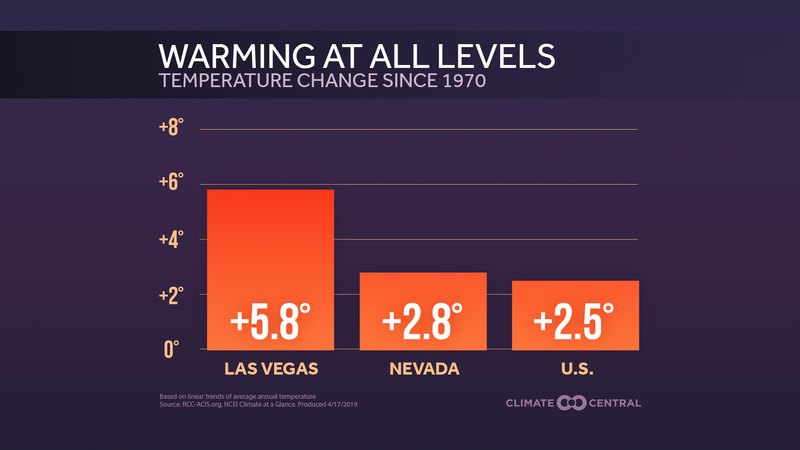 That tied the all-time U.S. record for the highest temperature on record for the month of June, and came close to tying the record for the world’s hottest temperature, which is 134°F, set in Death Valley in 1913. In Phoenix, even the overnight lows have been toasty, with an overnight low temperature of 91°F on June 30, for example, which tied the record-high minimum temperature for the date. While individual heat waves have ties to short-term natural weather variability, increasingly common and intense heat waves are one of the most well-understood consequences of manmade global warming, since as global average surface temperatures increase, the probability of extreme heat events increases by a greater amount. The heat this week poses a formidable obstacle for firefighters, since it affects wildfire behavior as well as human health. Heat is the No.1 weather-related killer in the U.S., according to the National Weather Service. Editor's Note: This story has been updated to incorporate one more year's worth of temperature data in the U.S.